Published: July 15, 2013 at 08:14 a.m. Updated: July 15, 2013 at 02:23 p.m.
One of the most classic moments in baseball All-Star Game history occurred when Bo Jackson crushed a ball deep into the seats at Angel Stadium in the 1989 classic. Oh, and you might have heard this, too, but Jackson was also a pretty good football player. In honor of the All-Star Game and Mr. Jackson, we're going to count down the six best NFL players who played Major League Baseball. And this list will be counted on their baseball accomplishments. Keep that in mind. That means contributions as a major-league baseball player. So John Elway, you don't make the list. Elway did well for the Oneonta Yankees in 1982, but we are looking for major-league experience. Cal Hubbard is the only person in the Hall of Fame for football and baseball, but he was an umpire, not a baseball player. For the record, six Pro Football Hall of Famers played Major League Baseball: Red Badgro, Paddy Driscoll, George Halas, Ernie Nevers, Ace Parker and Jim Thorpe. But which of these guys made the list? Nevers stills holds the NFL record for scoring 40 points in a game. That's almost more points than games. He appeared in 44 games as a pitcher with the St. Louis Browns (1926-28), went 6-12, and gave up two home runs to Babe Ruth during his record-setting 1927 campaign. Parker made his hay with the Brooklyn Dodgers. The NFL's Brooklyn Dodgers. Parker, who homered in his first MLB at-bat, played both baseball and football in 1937-38, but a .179 average helped push him to a Hall-of-Fame NFL career. Thorpe was the founding president of the NFL, but he did play six major league seasons (1913-1915, 1917-1919), and hit .327 in his final year. Thorpe drove in the only run in the famed Hippo Vaughn and Fred Toney double no-hitter in 1917. Jordan played three seasons with the Atlanta Falcons before joining the Cardinals in 1992. He retired in 2006 with a career average of .282 and socked 184 home runs. The top statistical player using Bill James' "Win Shares." Sanders might be the best football player on this list (at least according to this), but comes up just short. 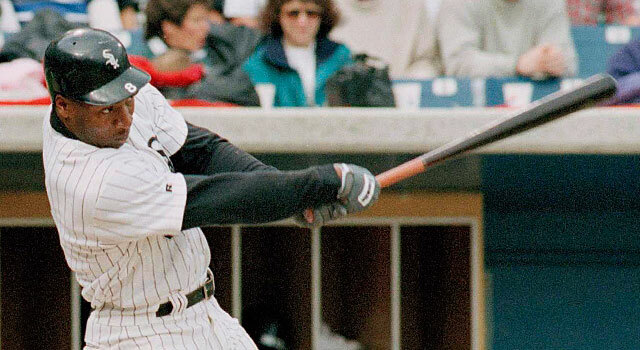 His best season was 1992 when he hit .304 and led the NL with 14 triples in only 97 games. He was blistering in the 1992 World Series, batting .533, which was truly a prime-time performance. But for most of his career, he had the same aptitude for hitting in baseball as he did in football. We'll always wonder how great Jackson could have been had he not been injured. Many remember Jackson's 448-foot home run in the 1989 All-Star Game at Anaheim Stadium which helped earn him MVP honors. But his most amazing feat was gunning down Harold Reynolds at home with an on-the-fly strike to catcher Bob Boone from the warning track in centerfield earlier in that season. "Pick Six: All-Time NFL Hipster Jerseys..."